Ideally located in the prime touristic area of Alotau, Tawali Leisure and Dive Resort promises a relaxing and wonderful visit. Featuring a complete list of amenities, guests will find their stay at the property a comfortable one. All the necessary facilities, including Wi-Fi in public areas, room service, airport transfer, meeting facilities, family room, are at hand. Each guestroom is elegantly furnished and equipped with handy amenities. Recuperate from a full day of sightseeing in the comfort of your room or take advantage of the hotel's recreational facilities, including private beach, outdoor pool, pool (kids), water sports (non-motorized). A welcoming atmosphere and excellent service are what you can expect during your stay at Tawali Leisure and Dive Resort. Offering an outdoor pool, a day spa, 2 restaurants and a cocktail bar, Crowne Plaza Port Moresby is 5 minutes' walk from Ela Beach. 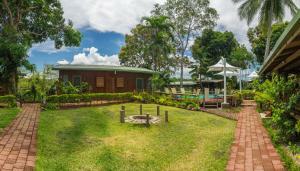 All accommodation features a flat-screen TV and views over the Coral Sea or harbour. Guests enjoy free airport transfers. Crowne Plaza Hotel Port Moresby is within 20 minutes' drive of Jackson International Airport and the National Museum & Art Gallery. The boardwalks of the National Capital Botanical Gardens are 25 minutes' drive away. Boasting 24/7 security, this hotel features a features a fitness centre, secure covered on-site parking and a tour desk. You can relax on the sun loungers alongside the pool, or unwind with a massage or facial at the Lotus Spa. 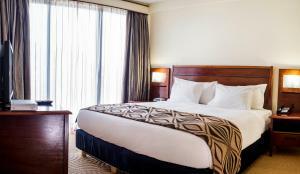 The air-conditioned accommodation options include private rooms and suites. All offer a satellite TV, a refrigerator and tea/coffee making facilities. Each has a private bathroom with a shower or bathtub, a hairdryer and bathrobes. Rapala Restaurant offers a grill menu and a selection of fine wines. Pondo Tavern serves international cuisine and boasts a patio deck offering sea views. Hilton Port Moresby is located in the Hohola District of Port Moresby, boasting a mix of lifestyle and heritage Papua New Guinea. The property features 5 restaurants and bars and an outdoor swimming pool. As part of the Star Mountain Plaza Development, Hilton Port Moresby is connected via walkway to the Kutubu Convention Centre, offering a range of state of the art event spaces. The hotel includes 212 luxurious bedrooms and suites with floor-to-ceiling windows. There is 24-hour room service available. 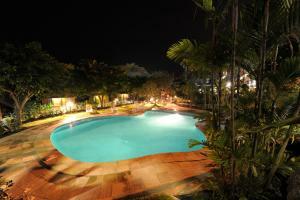 Guests can relax by the outdoor swimming pool, whirlpool or work in the fitness centre. Jacksons International Airport is 10 minutes' drive from the hotel. Offering some of Port Moresby's best nightlife options, Lamana Hotel houses a nightclub, casino and 6 bars. It provides a free 24-hour shuttle to Jackson's International Airport, a 5-minute drive away. Each room offers air conditioning and a refrigerator. Cable TV and ironing facilities are provided. Guests can enjoy a soothing massage, work out in the air-conditioned fitness centre or play a game on the outdoor tennis court. Staff can provide concierge and laundry services. Accompanied by a fine selection of wines, a range of Italian and international dishes can be sampled at Palazzo Restaurant. Room service is available. 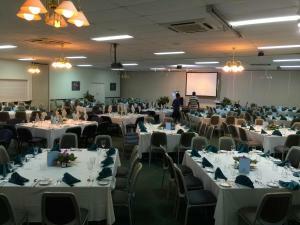 Located in Port Moresby city centre, Hotel Lamana is 2 km from the National Museum and Parliament House. 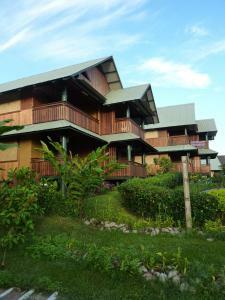 It is 4 km from the University of Papua New Guinea and provides free parking. Set upon a private beach, Liamo Reef Resort features an outdoor swimming pool and a tennis court. Located in Kimbe, this resort offers free WiFi and an on-site restaurant. 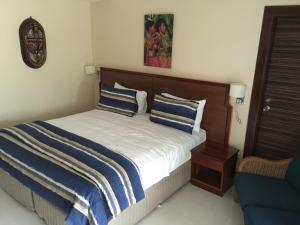 All rooms are air-conditioned and feature a sofa and a TV with cable channels. They offer a refrigerator and tea and coffee making facilities. The private bathroom includes a bathtub, a shower, and a hairdryer. An array of activities can be enjoyed on site or in the surroundings, including snorkeling and water sports. The property offers a games room and free parking. 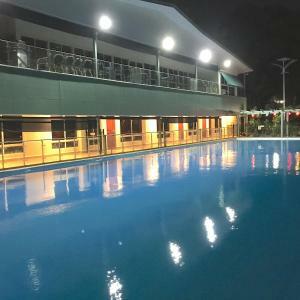 Offering a swimming pool, a fitness club, a day spa and restaurant, Holiday Inn and Suites Port Moresby is set on 12 acres of landscaped gardens. All accommodation features a balcony and a flat-screen TV with cable channels. Located in the Port Moresby government district, Holiday Inn and Suites is within 10 minutes' drive of the Solomon Islands High Commission, Australian High Commission and British High Commission. All air-conditioned accommodation features a refrigerator, tea/coffee making facilities and a dining area. All have a private bathroom with a bathtub and a hairdryer. Some accommodation offers garden views. 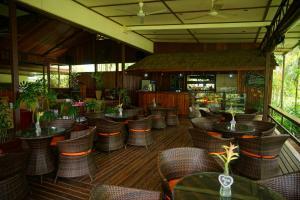 Kopi Haus restaurant is open for breakfast, lunch and dinner, serving à la carte meals and buffets. It features a covered patio overlooking the pool. Oasis Bar boasts poolside beverages and light meals. Junction Bar and Night Club is open daily. The fitness centre offers a tennis court, squash court and fitness classes. Guests enjoy free airport transfers to and from Jacksons International Airport, 15 minutes' drive away. 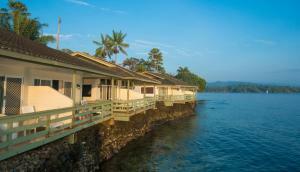 Kokopo Beach Bungalow Resort offers modern bungalows with private balcony boasting views of Blanche Bay. Guests have access to a private beach, restaurant, bar and outdoor swimming pool. 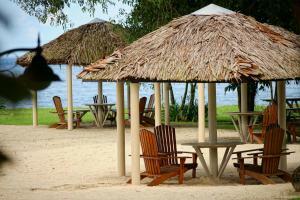 All accommodation at Kokopo Beach Resort includes air conditioning, satellite TV and ironing facilities. Each has a private bathroom and some rooms include kitchenette and laundry facilities. Free continental breakfast is served each morning. Open for breakfast, lunch and dinner, Hauswin Restaurant is built in an authentic traditional style with local timber poles and a sago roof. Kokopo Beach Bungalow Resort boasts sweeping views of New Ireland, the Duke of York Islands and the volcanoes surrounding Rabaul town. 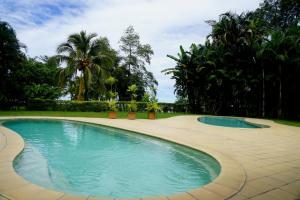 It is 5 minutes’ drive to the Kokopo Waterfront and 20 minutes to Tokua (Rabaul) Airport. Situated on a cliff-top terrace overlooking Tufi Harbour, this boutique resort offers 180-degree panoramic views. The tour desk organises diving and snorkelling trips all year round. All meals are included. Each bungalow at Tufi Dive Resort includes air conditioning, en suite bathroom and mosquito nets. 24-hour electricity and hot water are provided. Some bungalows have a verandah overlooking the sea. 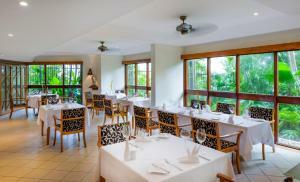 Guests can enjoy local seafood and tropical fruits in the dining room or a BBQ on the terrace with wines and cold beers. The outdoor swimming pool offers views of the fjord below. The nearest coral reef is just 15 minutes away by boat, with over 40 mapped dive sites. Other activities include canoeing, traditional outrigger safaris, trekking, bird watching and cultural experiences. Located in Oro Province, 250 km from Port Moresby, Tufi Resort is only accessible by plane. The airstrip at Tufi is a 3-minute walk from the hotel and airport transfers are available. This stylish and award-winning luxury hotel is set in its own botanical gardens with stunning views over Bootless Bay to the mountains. Port Moresby's Jacksons International Airport is just a 2-minute drive away. Each room features a luxury marble bathroom, cable TV and air conditioning. The spacious private balconies offer panoramic views. Selected rooms have complimentary access to The Health and Fitness Club. The fitness centre features a 20-metre infinity pool, squash courts and a floodlit tennis court. Steam rooms and a massage room are also available. The Spa offers an extensive range of treatments. 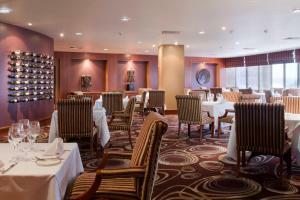 Guests have a choice of 4 dining options and there are several retail outlets within the hotel. Free airport transfers can be arranged. Complimentary newspapers are available everyday at reception. 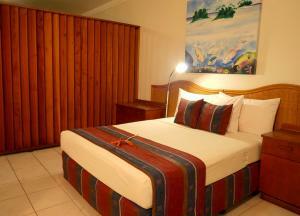 Airways Hotel Port Moresby is a 10-minute drive from the National Museum and Art Galley of Papua New Guinea.